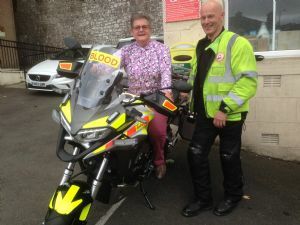 At a recent meeting of the Trinity Ladies' Fellowship we had a presentation by one of the Bloodbikers who came along to explain the work of the “Bloodbikers”. George (a Bloodbiker) explained that the Bloodbikers are a totally volunteer run organisation (funded by donations)covering Lancashire and part of Cumbria ) which transport blood specimens and blood from clinics, health centres and hospitals to wherever it is needed often in urgent situations. This is such a worthwhile cause saving the NHS lots of money. 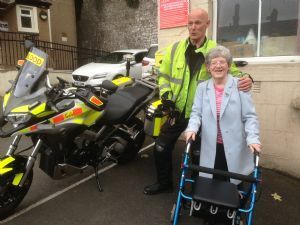 Two of our members, Sheila and Eunice enjoyed meeting George and Sheila even sat on his bike!